It's time for your holiday and you're coming to Croatia for the first time? Check our tips and recommendations for a pleasant stay in Croatia. If you feel you're not ready, don't worry - we've got your back. We hope all of your wishes for your dream vacation will come true. So, read the list of fun facts about Croatia that we've created just for you. 1. Passport to Dubrovnik – it's your first time in Croatia and you're driving from Split to Dubrovnik by highway. Keep in mind that you will, at some point be required to show your passport. The small town of Neum through which you'll pass on your way is located on the territory of Bosnia and Herzegovina.. The border control is constant there. Though the passage is quite simple and fast, keep in mind to prepare your passport if needed. 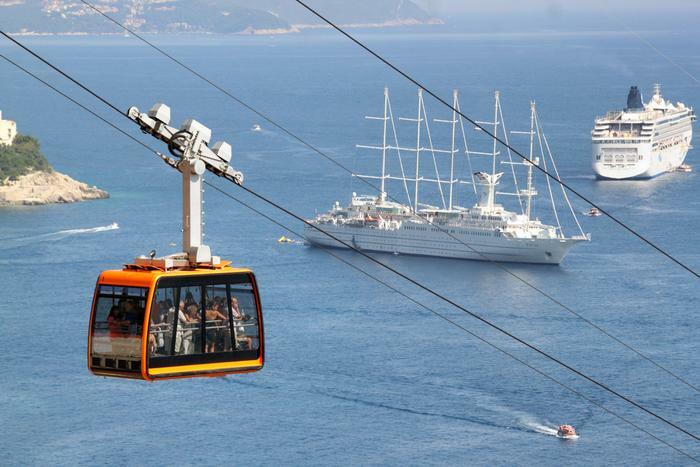 The ride Split – Dubrovnik lasts between 3 and 4 hours. See our offer of budget apartments in Dubrovnik. 2. Sea urchin – these little spiky residents of the sea are often found along the coast and it's necessary to pay attention so their spines don't land in your heel. Since it's known that small urchins prefer extremely clear water, it's not difficult to notice them. Though they might seem unpleasant it's actually comforting to see them in the sea since the sight of them is a sign of clean water. As far as their spines are concerned, our advice is to buy budget rubber sandals designed for marine activities and you can enjoy the sea to the fullest. 3. Ice cream – the culture of ice cream on the beaches and streets of Croatia during summer days is quite widespread. Ice cream in all possible flavors and a crispy cone are so tasty that they might not be good for neither your waistline nor your wallet. Don't say we didn't warn you. If you're coming for the first time to Croatia, buy a scoop of fine ice cream for a good start of your holiday! 4. Black risotto or Pašticada – this is a dilemma we're often facing. Seafood or meat? In Croatia, these two traditional dishes are very tasty and unique. Black risotto is made from cuttlefish and it gets a specific black color from natural cuttlefish ink. For the complete enjoyment feel free to sprinkle risotto with a little bit of grated hard cheese. Pašticada (beef stew), on the other hand, is a dish with a specific rich sauce based on herbs and prunes, served with home made gnocchi. 5. Walls of Dubrovnik – make sure to visit this beautiful historic city and definitely pencil a tour of the old city walls in your schedule. This extremely high construction is very open to the sun so it's best to go see it in the morning ,when crowds are much thinner or early in the evening, when you can enjoy the sunset. During the day, especially during the summer months, air temperatures are almost unbearable. 6. Drinking water – one of the facts that Croatia is proud of is tap water that is safe to drink. Namely, Croatia is rich in natural resources of drinking water and is highly ranked on the list of countries with the most healthy drinking water in Europe, but also in the world, according to the research published by UNESCO. So, feel free to use tap water for drinking! 7. Ferries and catamarans – just in case you didn't know, tickets for transportation are not sold on board nor at the entrance of the ship, but only in outlets provided for it. All outlets for tickets are regularly found in the ferry port, while in larger towns you can additionally find them in the city center. Also, tickets can be purchased online. 8. English language – most young people in Croatia speak very good English, so in case you need some advice or guidance, feel free to ask for help if you are able to communicate in English as well. 9. Weather in Croatia – it's clear that weather is perfect for swimming and enjoying the beach during the summer. However, don't forget about May and September! These months are also beautiful and pleasant for swimming. Huge selling point – prices are lower and the crowds are smaller! 10. Truffles – in Istria you can find white truffle, considered to be one of the best in the world. The season of these mushrooms with a unique taste and smell begins in September. Truffles are a true gastronomic delicacy that awakens the imagination in every expert chef. Browse our extensive offer of apartments in the Istria Riviera. We highly recommend it!